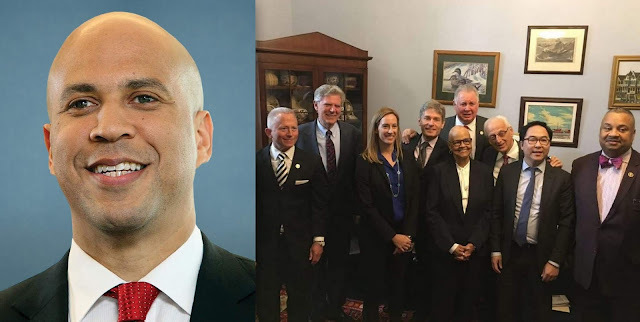 Sen. Cory Booker (D-N.J.) is leading the 2020 Democratic field in endorsements from his fellow congressional lawmakers. Booker has already locked up the public support of 12 lawmakers, including every member of his home state’s Democratic delegation. Fellow New Jersey Sen. Bob Menendez (D) was an early backer, calling Booker a “great friend” who would “make an even greater president” in his endorsement. The two have served together since 2013. Other contenders are also pulling in early support from their home states. But Booker's tally is more than double the five congressional endorsements secured so far by Sen. Kamala Harris (D-Calif.), who is in second. While the 2020 primary contest is still in its early stages, the coveted endorsements can give candidates a boost, helping them bolster their credibility and build momentum in what is expected to be a crowded primary field.